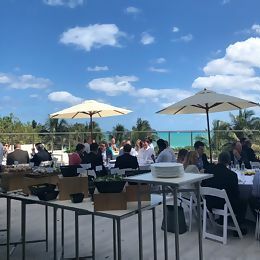 BancAlliance headed back to Miami this year, spending two glorious days in the sun while discussing everything from ever-more-elusive financial covenants to the new beneficial ownership rules. As always, there was something for everyone! More than 40 members attended the welcome reception. Despite the presence of a few rain showers (all while every weather report clearly showed a zero percent chance of precipitation), members had a chance to catch up as Phil Mickelson landed a victory in the WGC-Mexico Championship, and the stars began turning up on the red carpet at the Oscars. Again, something for everyone! After we rounded up the last of the Vitamin D chasers lingering over lunch outside, and convinced everyone that the party was indeed moving to an air-conditioned ballroom, we began the meeting with our usual welcome followed by the membership update and consumer and small-business partnership updates. Here’s the Cliff’s Notes version: Membership continues to grow (24 new members since the Fall 2017 member meeting); it is now possible to purchase only A/B loans on the consumer platform if members have a more restricted risk appetite and accompanying lower return requirement; and, we are in the process of piloting a Fundation-powered software known as Leeroy that allows members to selectively market small-business loans within their communities using a very cool screening algorithm (inputs can include Yelp, Google reviews, Foursquare, etc). Stay tuned for more enhancements in this area. We then moved to an extended update on the commercial loan program based on requests from our fall 2017 meeting requesting more airtime from the senior members of the portfolio team. (See, we do read survey results and act accordingly!) Members heard about market conditions, current portfolio performance and expectations for the rest of 2018. We then turned to a state-of-the-ABL-world conversation led by Congressional Bank’s ABL team. We are in the process of soliciting member feedback as to whether this asset class is of interest to BancAlliance members, and the session generated some great audience participation. We love that our members are never shy! Finally, we broke for focus groups to end the day, with some of the most crowded rooms for New Initiative Update/What’s the 411 on the 504 pilot, Commercial Loan Restructurings (who doesn’t love a good workout session?) and New Banking Innovation with Brian Graham (who offered a funny summary of all the fintech conferences he has attended lately). We also hosted sessions of our consumer and small-business program working groups. By the time we had all finished being so productive, the wind had died down enough to enjoy cocktails and dinner outside. Tuesday morning brought us crashing back to reality with our always-popular regulatory panel discussion, albeit this time with a twist. This meeting’s panel featured BA members with a no-longer-secret regulatory background. It was a great discussion, and generated a good deal of note-taking by the audience. We then kicked off our brand new “Member Bank Case Study” segment featuring Tennessee State Bank. Team members discussed their process for building their gorgeous website with a very focused eye towards customer acquisition. Judging by the initial, overwhelmingly positive feedback we heard, this segment is definitely going to become a regular agenda item going forward. Finally, we heard from Brian Sterling, co-head of investment banking at Sandler O’Neill. He provided a succinct and comprehensive assessment of the current banking landscape, with lots of supporting detail (another presentation where we saw pens flying across the presentation books). Finally, it was the usual round of goodbyes and business card trading followed by a mad dash to the airport or the pool bar for one last mojito. See you this fall back on our home turf! Our annual meeting is scheduled for September 24-25 at the Fairmont Hotel in sunny (maybe), tropical (perhaps, if cherry blossom trees count), and swampy (always) Washington D.C.